Race through the beautiful autumnal vineyards for this wine-fuelled half marathon. Great for all runners, this mostly-flat race will take you along the creek as you run from the winery to the finish by the lake. Come along for the medal, t-shirt and Wine & Music Festival. Join us as we run though the heart of Sonoma Countys Dry Creek Valley. This series favorite takes place in late autumn when the hillsides are painted with rich, golden hues and the valley air is crisp and fresh. Registration for this popular event is limited to 2,500 runners due to our commitment to minimize the impact in this beautiful area and to provide our guests with a quality destination running experience. This course is very scenic and easy to medium difficulty, with gentle rolling terrain on backcountry roads. 2019 brings the return of a previous course. Starting at Francis Ford Coppola Winery and finishing at Warm Springs Recreation Area, you’ll fly through Alexander and Dry Creek Valleys as you make your way to the Post-Race Wine & Music Festival at the Finish Line. The Hallowine 10K starts at Martorana Family Winery in Healdsburg and follows the final 6.2 miles of the half-marathon course before finishing at Warm Springs Recreation Area for the post-race Wine & Music Festival. See the Course Map above for route details. This event is limited to 300 runners. Note: There is NO parking at the Start of the 10K. All Runners must take Race Shuttles to the Start. Runners will be assigned to different waves based upon the estimated finish times they indicated on the registration page. Each wave will consist of approximately 100 runners. Mile 2.3: Corner of Dry Creek Road and Canyon Rd. Reach by driving north on Dry Creek Rd. Mile 7.8: Dry Creek General Store at Dry Creek Rd and W. Dry Creek Rd. Reach by driving south or north on Dry Creek Rd. Limited parking, arrive early. Mile 10.7: Ridge Winery at Lytton Springs Rd and Chiquita Rd. Reach by driving north on Chiquita Rd. from Grove St. in Healdsburg. Finish Line: Park at Warm Springs Recreation Area and use the designated road to view the finish line. The Half Marathon race starts at 7:30am PST. The 10k race starts at 8:30am PST. Where can I view maps of the course? See The Course & Registration Options page for details. Where can I learn about transportation to and from the race? See the Transportation page for details. What is allowed, or not permitted on course? This varies from race to race; see Race Info for details. What happens if I cannot finish the race or keep the minimum required pace? Transportation to the finish area for stranded or slow walkers without medical problems is provided via the SAG vehicle. In the event you cannot finish the race, please make your way to the nearest aid station and ask for SAG assistance. The SAG vehicle will be following the final runner/walker and will pick up as they pass aid stations. Typically, all race results are posted within a few hours after the race. Visit the Results & Photos page for more details. When are the official race photos available? You will be able to download your 2018 race photos for free and share across your social channels following the race. Visit the Results & Photos page for more details. Are volunteers needed for the race? Yes, the race wouldn’t exist without the support from hundreds of volunteers! While we have various organizations that provide volunteers, we also welcome individuals to sign up to volunteer. Please visit the Volunteers page for more details. The Race Expo is held the day before the race and is open to the public and free. We recommend attending the expo! However, Early Packet Pickup and Race Day Packet Pickup services are available for the runners that cannot make the Race Expo. See Expo page for details. Can someone pick up my packet for me? Yes, you may authorize a friend, teammate or family member to pick up your race packet for you. They must bring a copy of your photo ID to packet pickup. Be sure to have them look up your bib number first upon arrival as bibs are distributed by number, not alphabetically. I have a question about registration or the event that is not answered here or on the website. For online registration issues contact the ACTIVE Network’s customer support team at [email protected] or 877-228-4881. Log into your MyEvents.ACTIVE.comaccount, find your race entry, and click the “Edit registration” button to make updates to your registration. The deadline to make edits to your registration is October 24th, 2019. Yes, you can switch from the half marathon to the relay if there is still capacity. You must email the registration team at [email protected] facilitate the change in race distance. If the current price of the relay is more than you paid for the half marathon, you will be prompted to pay the difference in fee from the half to the relay. The deadline to make edits to your registration is October 24th, 2019. Switching from a longer distance to a shorter distance:There is no fee to switch to a shorter distance. There are no refunds for the difference in price between the two distances. Switching from a shorter distance to a longer distance:You will be prompted to pay the difference in fee from the shorter distance to the current cost of the longer distance. Late Category transfers:If you miss the deadline to change race distances, you will be able to make the change at the Expo for an administrative charge of $10 plus any additional price difference for longer distances (based on available capacity). You must run the race for which you are registered for or you may be disqualified. Race Extras can be selected during registration. If you did not purchase at the time of registration, log into your MyEvents.ACTIVE.comaccount, find your race entry, and click the “Purchase merchandise” button to add Race Extras to your registration. Defer Your Entry: You may defer your entry to the 2020 event. Deferrals must be processed by the registration team and an administration fee of 50% of the cost of the following year’s registration cost will be charged in the event you defer. The deferral will expire after the 2020 event and you will not be able to defer your registration again. Deferral requests must be submitted by email request to [email protected] later than October 12th, 2019. Transfers: You may not give or sell your number to anyone else. However, bib transfers are allowed for an administration charge of $25 and must be processed through your ACTIVE MyEvents account no later than October 24th, 2019. If you transfer your bib, you will receive a refund (minus the $25 administration charge) once the new participant signs up. The new runner will need to pay the full entry fee at the time of the transfer. Log into your ACTIVE.comaccount and select “Transfer registration” to begin the process. This is a perfect Halloween race! It is set in amazing Sonoma County among the vineyards. The views while running were stunning. Great atmosphere, great wine, great race! Many friendly people were running in costumes making the race even more enjoyable. I would recommend this race to anyone looking to experience great wine, scenery, and people. I ran this race in 2014. I was invited as a blogger and received a VIP registration in return for my review. 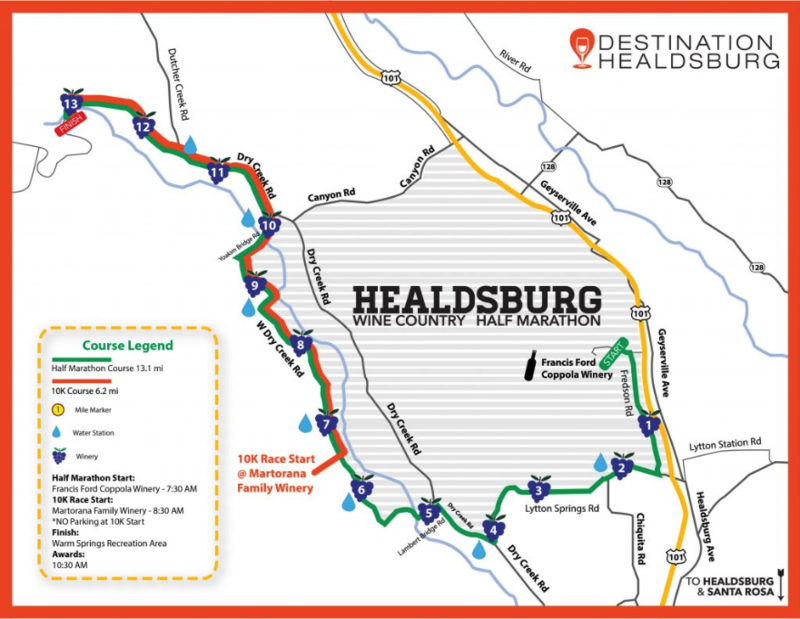 You can read my full blog review here: http://reasontoplay.com/healdsburg-wine-country-half-marathon-recap/ This race has a great expo and awesome pre-race events when you sign up for VIP events. Professional runners Dean Karnazes and Sarah Hall both ran the race in 2014 and Dean participated in a pre-race dinner. The day of the race transportation was easy to get to. You ride a bus from the finish line at the winery where you also park your car. It was rainy the morning of the race but the race directors had tents we could huddle under and coffee to keep us warm. The race started on time and was sent off with cheerful banter and lots of costumed halloween runners!The course itself was gorgeous. The first mile is on a gradual uphill and the rest of the race has a few rolling hills through wine country. There are water stations and wine stations on course and fans cheer at different points throughout the race. The race has a flat, fast finish and a great finish line experience. Plus the medal was awesome! I love destination races and this one I would definitely do again. Everything from registration, to race, to finish went smoothly. The IPA 10K, Brewfest and Beer Mile Invitational is a multi-experience event held at The Barlow in Sebastopol, California. The Barlow is locally inspired marketplace full of shops, restaurants, breweries and experiences, located in the heart of Sonoma County's dynamic microbeer, wine and food scene. This highly-acclaimed event is only in its third year but has drawn rave reviews for its scenic 10K course, post-race Brewfest with live bands, and the highly entertaining Beer Mile and Brewery Relay Challenge. Your 10K entry includes a pre-race cider or beer toast, race shirt, beer themed finishers medal, mini-pint, entry into the Brewfest, with live bands, awards, food trucks, product sampling and close up viewing of the Beer Mile and Brewery Relay Challenge!